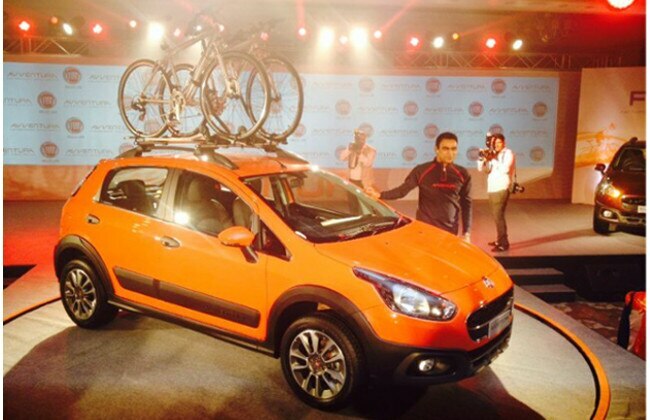 Fiat's much-awaited Avventura crossover made its way to Indian market today. Priced between INR 5.99 Lakh and INR 8.17 Lakh, the vehicle is Italian carmaker's take on this growing crossover segment, and competes against the likes of Volkswagen Cross Polo and Toyota Etios Cross. The Avventura is based on the same platform as the company's Punto Evo hatchback, though, the crossover has quite a few distinguishing factors over its hatchback donor. Its styling looks beefier with plastic body cladding all around the body. For further enhancement in its SUV-ish stance, the vehicle gets a large tailgate mounted spare wheel with a well designed wheel cover, a trapezoidal tail pipe and most importantly a 205mm ground clearance. All-new 16 inch alloy wheels, which comes as standard on variants, further accentuate the high set stance. The Avventura comes in two petrol – Active and Dynamic, and three diesel variants, with a top of the line Emotion variant. The petrol variants don’t get ABS with EBD or airbags, while the range-topping diesel comes equipped with all bells and whistles. In terms of color options, the Avventura comes in six body shades, including the auto-expo showcased trademark Zafferano Orange shade. While the other choices comes in the form of Bronzo Tan, Minimum Grey, Exotica Red, Hip-Hop Black and Vocal white. Powering the petrol variants is a 1.4-litre Fire engine, while the trusted 1.3-litre Multijet works under the hood of diesel variants. Both the powertrains are carried over from the Punto Evo hatchback without giving any revamp. Thus, the natural-aspirated petrol engine churns out 92bhp while the diesel is good for 89bhp, delivering thrust to front wheels via a 5-speed manual gearbox. The diesel delivers claimed fuel economy of 20.5km/l while petrol model delivers 14.4km/l.